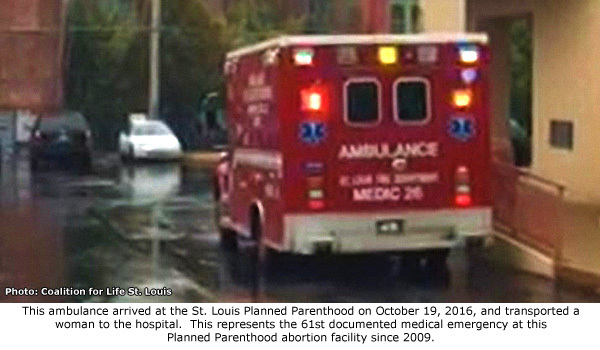 St. Louis, MO – The Coalition for Life St. Louis is reporting that an ambulance was seen at the Planned Parenthood abortion facility in St. Louis, Missouri, on Wednesday, October 19, 2016. This represents the 61st documented medical emergency at the St. Louis Planned Parenthood since 2009. According to Brian Westbrook of the Coalition for Life St. Louis, volunteers with his group spotted an ambulance as it rushed into the Planned Parenthood parking lot at about 1:20 p.m. with lights flashing and sirens blaring. “Over the course of the next twenty or so minutes, a woman was brought out on a stretcher while clinic workers walked beside her holding a sheet up so as to block her from view. She was taken away in the ambulance around 1:40 PM, with no sirens or lights, as those outside of Planned Parenthood’s gates lifted her up in their prayers,” Westbrook said in a written statement. Operation Rescue sought public 911 records from the St. Louis Fire Department related to the numerous medical emergencies at the St. Louis Planned Parenthood, but was forced to sue in 2013, when each request was wrongly denied. Earlier this year, as part of a settlement agreement, the Fire Department released a list of 911 calls that showed 58 medical emergencies occurred at the St. Louis Planned Parenthood abortion facility since 2009. Since that release, there have been four additional medical emergencies there.